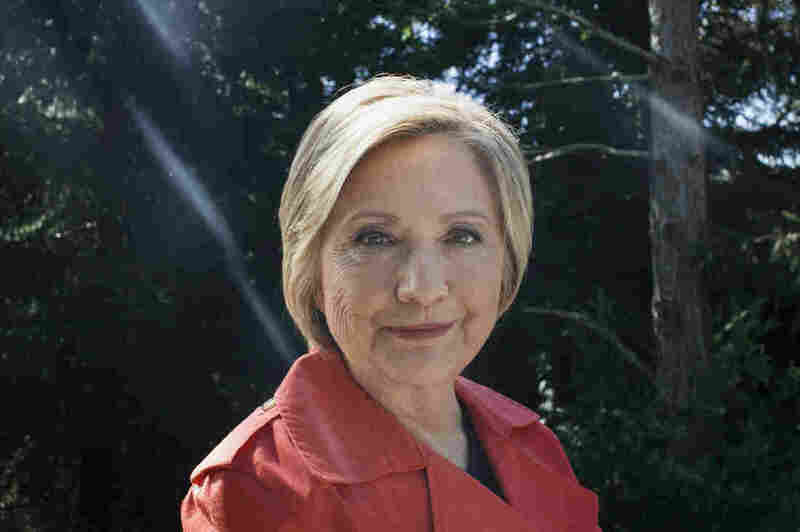 Hillary Clinton Book Interview: In 'What Happened,' Clinton Is Done But Not Over In interviews with NPR, Clinton discusses her life since the election she didn't expect to lose and why she lost. And she offers scathing criticism of President Trump. 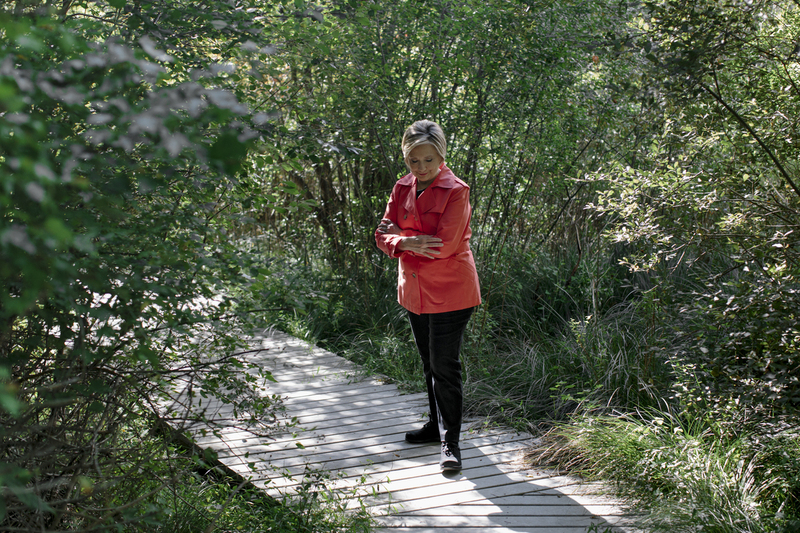 Hillary Clinton at the Glazier Arboretum Park, where she often likes to hike, in Chappaqua, N.Y.
"I'm not going anywhere. I have the experience, I have the insight, I have the scars that I think give me not only the right, but the responsibility to speak out," Clinton said. In her new campaign memoir, What Happened, and in interviews with Morning Edition's Rachel Martin and NPR's Tamara Keith, Clinton talks about her own failings, but she doesn't hold back on calling out sexism in American politics and heaping criticism on President Trump. "I think he's being played," Clinton said of Trump, suggesting that he's given aid and comfort to Russia's Vladimir Putin and North Korea's Kim Jong Un. "I think he doesn't even understand the kind of strategic overview of what's happening in the world, and what we need to be doing to prepare, and so I'm gonna keep speaking out." Asked if she is able to turn on the news without thinking, "What would I do in this situation?" Clinton responded with a laugh. "No, I do it every single time! Look, I was prepared to be president. I had prepared and worked at it, and I go a little bit batty when I hear him say, 'Gee, this is a really hard job. Who knew health care was so complicated?' I did. No, I always am responding and reacting. Sometimes I yell at the TV even." But Trump is the one in the Oval Office, not Clinton, and she offers a series of explanations for what she did wrong, in the book and in her interviews with NPR. "I take ultimate responsibility for the loss," Clinton said. "I was the candidate. I was the person whose name was on the ballot. And I'll never get over that." There was the private email server she used for official business while secretary of state, a cloud that hung over her campaign from start to finish. "It was a dumb mistake. I think it was a dumber scandal, but it hurt," she said. She also describes an inability to connect with the anger coursing through the electorate. "I understood there was anger and fear and people were really unhappy because of what had happened in the financial crash. I understood all of that," Clinton said. "What I didn't — and I say this in the book — I didn't really do well is conveying how much I understood of that, conveying how I got the despair and the anger." Clinton had plans — so many plans — for combating the opioid crisis, for helping people in coal country, for creating jobs through infrastructure spending and more. "I talked about it, but I didn't really convey the emotional resonance," she said. While Trump was sending a signal to voters by talking about making America great again, bringing back coal jobs and building a wall, Clinton's detailed plans didn't break through. "The amount of time and effort we spent not only devising the best infrastructure plan you could imagine but figuring out how it was gonna be paid for, nobody cared," she said. Meanwhile, she said, Trump tapped into something, even fed it. His message was "discriminatory, it was bigoted, it was prejudiced," Clinton said. "And yet it fed into part of the electorate that just wanted to have a primal scream. They didn't like what was going on. They wanted something different. They weren't interested in what you could actually do, because clearly Trump hasn't done very much that he said he would do. But they really responded to his racial and ethnic and sexist appeals." And while Trump started his campaign with a memorable line, Make America Great Again, Clinton said her team was headed into the general election trying to develop a theme that fit. "I had three different very smart groups work independently, and I asked them, 'So what should be the theme of our general election?' And they each, amazingly, came up with the same slogan: 'Stronger Together.' Because what they argued, and what I believed, was that America does better when we're working together, when we're helping each other, when we're aiming toward a future of opportunity where we have broad-based economic growth that includes everybody, and where, yes, we stand up for human rights and civil rights," Clinton said. But, asked to choose her biggest regret, Clinton didn't look inward. "Losing is my biggest regret," she said. "And losing to someone who was not qualified and did not have the experience or the temperament to be president of the United States. That is my biggest regret." Clinton says her biggest regret from the 2016 presidential election is losing. Clinton deflected the question of whether another Democrat could have beaten Trump, saying, "Well, I don't think it's useful to speculate, because I was the nominee." "Well, he wasn't. And you know he ran in '08, and he didn't run in this this time — if he wants to run in the future, he can do that," she said. In an election decided by fewer than 100,000 votes in three states, Clinton argues any number of factors could have decided the election. "I was on the path to winning, and I felt great about the three debates," Clinton said when asked about issues of trust that dogged her campaign. "And then unfortunately the Comey letter, aided in great measure by the Russian WikiLeaks, raised all those doubts again." Less than two weeks before the election, then-FBI Director James Comey told Congress that the bureau would be revisiting its investigation into the handling of classified information in connection with Clinton. On Nov. 6, he said a newly discovered trove of emails did not change the FBI's recommendation that Clinton not be charged. Nevertheless, Clinton has repeatedly placed blame on this sequence of events for undermining her candidacy at a crucial moment. WikiLeaks' release of thousands of emails allegedly tied to Clinton's campaign chairman, John Podesta, is another frequent target of hers. The documents disclosed internal campaign deliberation about Clinton's private email server and excerpts from her Wall Street speeches. The campaign linked the release to Russia. In the states Clinton lost, she argues voter ID requirements and other changes in the law made it harder for people who supported her to vote. "In Wisconsin, Michigan, Pennsylvania, in particular, as well as North Carolina, there was a concerted effort to suppress the vote," she said, recounting anecdotes about people whose identification didn't qualify them to vote in Milwaukee. As for Russian interference in the election, Clinton thinks that in addition to the investigation being led by special counsel Robert Mueller, there should be an independent commission, like the 9/11 Commission. "And if we don't come together as a country and with leadership from the White House and the Congress to combat it, to try to prevent it from happening again, we are really putting our democracy at risk," Clinton said. She has been following the twists and turns of the Russia investigations and devotes a chapter of her book to the topic. "We're only now finding out what we did try to warn people about starting last summer," Clinton said. But back then those warnings were often dismissed as a campaign trying to distract from the damaging revelations from the WikiLeaks emails. "And I think because it was so surreal — how, what do you mean the Russians are influencing our election? Now we know. Not only were they, they did. And not only did they, they will continue to do so." Clinton devotes a chapter of her book to being a woman in politics, and in conversations with NPR, she had a lot to say about it. Clinton said it is clear some share of the electorate "is just not ready" for a woman to be president. "They just cannot imagine it, and they are resistant to it. And I want in this book to make it very clear that what happened to me was not just about me," Clinton said. There were some voters who said they were open to a woman as president, just not that woman, in reference to Clinton. But she doesn't buy that a different female candidate would have had it any easier. "Look, if you think it's just about me, you don't have to deal with it. ... OK, I lost, you know? Have a nice time walking in the woods. But if you think it's endemic, as I believe it is, and that when a woman sticks her head up, she gets hit from both the right and the left by men who — primarily men — who do not want to accept the reality of a woman being a leader, an executive," Clinton said. Her reference to men on "both the right and the left" isn't without purpose. In the book she has harsh words for supporters of Bernie Sanders, so-called Bernie Bros, who intimidated her supporters online to the point that they hid their feelings in private Facebook groups. "I want people to understand sexism and misogyny are real," Clinton said. "They're real in business, they're real in politics, and people have to start standing up against it. And we have to equip young women to be able to ward it off and speak out, and we have to encourage men, particularly young men, not to buy into it. And we have to recognize there are deep stereotypes." As to the claim from some Sanders supporters that Clinton ran with a sense of entitlement, she said, "I just totally reject that." Clinton called the criticism "off base." Even after she clinched the nomination, she said, Sanders "just kept going, and he and his followers' attacks on me kept getting more and more personal, despite him asking me not to attack him personally. And you know, I really regret that. But now he's got a chance to prove that he's something other than a spoiler. And that is to help other Democrats. And I don't know if he will or not, but I'm hoping he will." Immediately following her election loss, Clinton returned home to Chappaqua, N.Y., and spent a lot of time hiking in the woods nearby with her husband (the former president) and their dogs. "It was part of a process after the election to come to terms with having lost, and my personal disappointment in letting millions of people down. Also my fears about what a Trump presidency might mean for our country and the world," Clinton said, back in the woods for her interview with Keith. "So I had a lot to think about. And I think well when I'm walking. I sort of clear my mind." That first day in the woods, she ran into a woman walking with her baby and dog. Her Facebook post spawned a meme, "HRC in the wild," and rapidly led to people looking for Clinton in the woods. "One time we drove up here to go for a walk, and there were about a dozen people lying in wait, and I thought, 'OK we're gonna go somewhere more peaceful than that,' " Clinton said. As the interview wrapped up, Clinton was approached by two women and a yellow Labrador.